Illinois cross country is an all time right now on the girl's side. It seems like every weekend there is something great happening around the state. Heck even when the best teams travel across state lines, it's all good. The Naperville Twilight Invitational scene was set at exactly the right time and place. The host school followed by Yorkville and Downers Grove South were fresh off of a clean sweep up in Minnesota at the prestigious Roy Griak Invitational. Yorkville, a former 2A school, was especially on a sugar high after winning the sweepstakes. So it would be interesting to see how the Foxes would fare in another title bout. Individually, nothing more could be said about the deepest field in meet history. 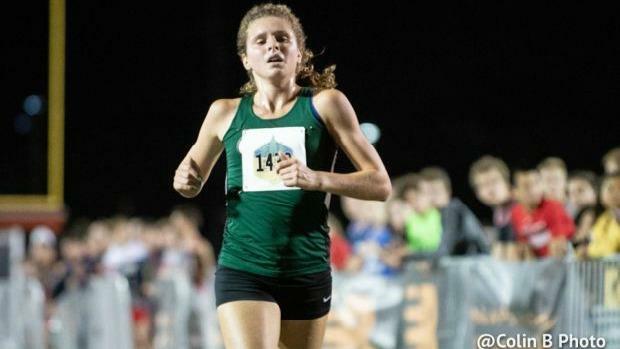 By first-hand account, there were 14 active MileSplit IL premium performers on the starting line when the gun sounded at 7:30p. If we were to include several more that was on the list, it would swell to almost 20! All of this chatter and we haven't mentioned the most supreme of them all... KATELYNNE HART! We will take a dive inside of all of these items. Naperville North Head Coach Dan Iverson serves as meet director and that as stressful as it is could be a soothing moment since his US#5 squad dropped the decision up in Minnesota. Iverson can attend to meet administration and his kids can concentrate on preparing on racing. That is until about 10 mins before the gun was to go off. The key to an all-around great performance is the start. Twilight meets for varsity runners start in prime time. It is a time where the course can be very dark in places and some kids have trouble with spots that may not be as lit as others on the course. However, the Huskies would soon find the home cooking to their delight. As the race unfolded it was very evident that the Huskies was going to have a great meet. Of course, Hart got out well ahead of the field and freshman Katrina Schlenker followed cautiously in pursuit. Naperville North senior Alex Morris quickly linked up with Schlenker and from there it appeared as things would fall into place. They ran through the first mile together in approximately 5:28. Soon after were the packs of Naperville North and Yorkville. The Huskies had a slight edge through five scorers which hit in the mid 5:40s to the early 5:50s. Downers South had its leading ace junior Brenna Cohoon way up front from the litter. And every other playing team was spread out. The middle mile did not change much and it was on to the final stages of the race which entered the stadium. Morris hit the tape just a few seconds in back of Schlenker in third place with a time of 16:58. Lucy Westlake, Audrey Mendrys, and Campbell Petersen composed the scoring spots 2, 3 and 4. Claire Hill closed the scoring in the 21st position. Yorkville, on the other hand, tried to retaliate with Kailey Fox (6th), Emily Eberhart (7th), and Helena Kleronomos (12th). They are arguably the top trio in Illinois and on any given day. On this day they were good but came up a little short on the strength of the #5 position further back. The final score was the Huskies 70-80 over the Foxes. The Mustangs took third with 103 points. Glenbard West was sixth in the team scoring behind Minooka and Wheaton-Warrenville South, but Hart was victorious for the third straight time. Coming into the meet she had been idle for almost three weeks. She was well aware that the chatter had been put on some of the emerging talent around the state. Nationally, Katelyn Tuohy dominated the discussion. So it was not a big deal to Hart who only knows how to win races big. Such was the case when she immediately left the great field in her wake with an opening mile under 5:20. It was pretty much over at the 2k mark and she allowed the fans to focus on the team aspect. But as Hart entered the stadium en route to the win the crowd was cheering very loudly. She hit the tape more than 18 seconds in front of Schlenker in 16:35.